This article is a preliminary framework article and comments/additions are invited. The early days of establishment of the Port Kembla steel plant were testing times. The company, Hoskins Iron & Steel (HI&S), was attempting to transfer production in full from Lithgow to Port Kembla, some 150 miles, while at the same time maintaining adequate production to financially underwrite the task. 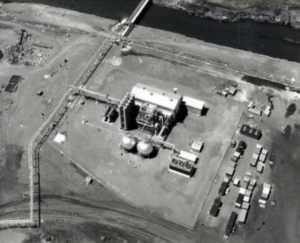 The plant envisaged for Port Kembla included a blast furnace, open hearth steel furnaces, rolling mills and related ancillary plant such as service plant, machine shops and maintenance facilities. Early products were to include structural steel sections and rails. Economic considerations dictated that a substantial amount of the mill plant from Lithgow be re-used in the new location – meaning that the changeover from one site to another was a complicated operation. The undertaking was made the more difficult (particularly financially) by several external factors affecting raw material inputs to the new plant. The first issue lay in the supply of an iron ore acceptable in both quality and price. The alternatives sources open to the company included three NSW deposits (all relatively low grade), Savage River in Tasmania, Cockatoo Island in northwest Australia (on which the company held a lease) – or supply from South Australia via its large competitor, the Broken Hill Pty Ltd (BHP). 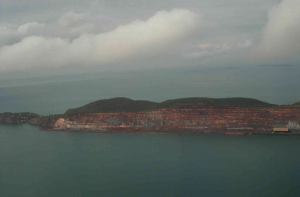 Both Savage River and Cockatoo Island ores had significant cost implications, and the final choice emerged as supply from BHP. This was later to pose some difficulty for HI&S. A second issue related to limestone (a necessary flux). Supplies were available from company owned leases near Marulan, in the Southern Highlands – but that product had to be transported to Port Kembla, which in turn dictated the need for a new rail line branch between Port Kembla and the main north-south rail line at Moss Vale. It was no small task – the first 26 miles of the line rose at an almost constant grade of 1 in 30, to reach 2000 feet above the near-sea-level steelplant site. Negotiations took place with the state government towards an arrangement which, in return for the state government constructing the line, committed HI&S to certain freight tonnages (and hence government revenue). This arrangement was to later be problematic. Construction of the line did not effectively commence until February 1927, after a ‘commencement’ ceremony in June 1925. 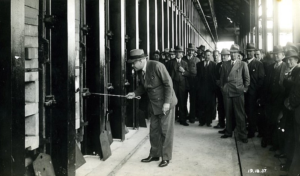 Although scheduled for completion by February 1930, the line in fact was not officially opened until August 1932, the two year delay adding financial pressure to the new enterprise. 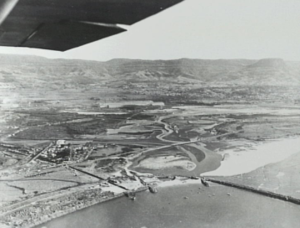 In the year the rail line was commenced, arrangements had also been concluded for the construction of a wharf in Port Kembla harbour, and HI&S personnel including one of Charles Hoskins’ sons, Sid, travelled to the US seeking a design for a blast furnace and associated plant. (The US at that time was regarded as being a world leader in such technology.) To finance initial construction, the then-private HI&S was floated as a public company, raising some £325,000 in 1926, sufficient to cover the blast furnace and ancillary plant. Construction then commenced in 1926 of a first stage comprising an 800 tons/day blast furnace (to a design by Freyn Engineering of Chicago), ancillary plant including steam boilers, blowers and power generation, materials handling facilities including railway tracks, and a jetty equipped with a modern ore unloader. Construction was to continue through to 1928, with the first iron ore arriving (in a BHP ship Iron Warrior) and handled through the plant in July 1928, with the blast furnace blown in in August. 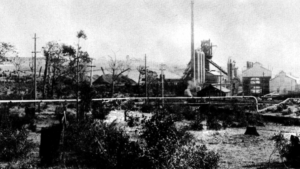 Successful operation led to the closure of the blast furnace capacity at Lithgow at the end of 1928, and Port Kembla pig iron being then supplied to the steelmaking facility at Lithgow until 1931. Such a division of operations was not of course economically desirable. 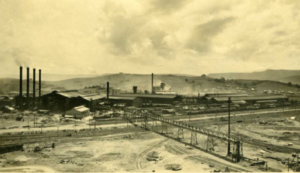 While initial development included only ironmaking, the Hoskins’ experience with Lithgow had indicated the importance of overall site and operations planning in order to achieve integrated plant operation. So from the outset attention was paid to overall plant layout, as well as individual plant design. They were also under financial pressure from the overall project cost, and the disadvantage of having ironmaking and steelmaking on separate sites. An early initiative involved securing the rights to the DeLavaud centrifugal casting (‘spun pipe’) pipe manufacturing process. Then followed the setting up of the second production process at Port Kembla, with the spun pipe plant operating from June 1929. That was demonstrated to be a wise decision as the pipe market proved to be robust, even during the days of the then-approaching Great Depression. Financing the development of further production plant was not feasible for HI&S alone, and hence support was mobilised from other interested parties who contributed in cash and/or in kind to the formation of the company which was to develop the plant – Australian iron & Steel (AIS). That company was to acquire all the assets of HI&S. Three other firms were involved in its formation in 1928 – Dorman Long (who contributed fabricating plants in Sydney and Melbourne, and an agency for the distribution of their imported steel products), Baldwins Ltd (who contributed a relatively new and little used rolling mill from their works at Margam in the UK) and Howard Smith (who were to provide shipping and agency services). Various cash adjustments were made, with 2.1 million ordinary shares being allotted to the four participants (HI&S shareholders 1.0m, Dorman Long 0.6m, Baldwins 0.1m, and Howard Smith 0.4m). In addition, further preference shares were issued through the Stock Exchange, to a total of 1.0m preference shares. The additional finance raised through these transactions was some £1,000,000, to pay for the next stage of plant development. Following the death of Charles Hoskins, the company was now being run by his two sons Cecil and Sid – the two being joint managing directors, and Cecil chairman of the company. The first production plant, the blast furnace, was blown in on 29 August, 1928. 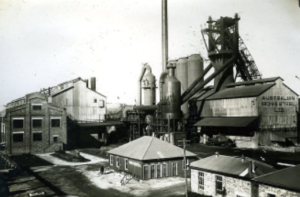 Satisfactory operation meant that by mid November 1928 both Lithgow blast furnaces were shut down, to be demolished for scrap. The second new facility, the spun pipe plant, was commissioned on 26 June, 1929, auguring well for the economic future of the new operation. The events of October 1929 though changed the world totally for the new enterprise. The aftermath of the US stockmarket crash saw Australian unemployment rise from 10% in 1929 to 21% in 1930, and 32% in 1932. The impact of the international depression was devastating to the Australian economy and society generally. From a 1929 nett profit of £215,040, AIS only barely broke even in 1932 with a nett profit of £2203. The blast furnace operated intermittently, incurring damage as the result of that. Over most of the period, till 1931, pig iron was being railed to Lithgow for steelmaking there. So costs were high, and with poor markets the rate of development slowed markedly, although continuing. One outcome was a much greater re-use of old plant and equipment from Lithgow (particularly smaller rolling mills) than had been intended. Adding to the financial discomfort was a £25,000 penalty paid the NSW government for failure to meet projected tonnages on the new rail line to Moss Vale (notwithstanding its two-year late completion). 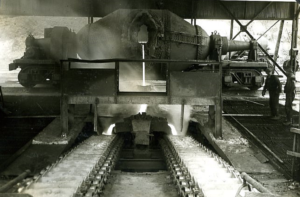 Equipment installed during this time included steelmaking capacity in open hearth (OH) furnaces, a bloom and 36” mill, and ingot soaking pits with their associated ingot and mould handling facilities. The first heat of steel was tapped from the first OH furnace on 8 November 1931 and by 20 November 1931 that steel had been rolled to billets through the bloom and 36” mills. Those billets were taken to Lithgow for rolling through mills there. The last steel was rolled at Lithgow on the afternoon shift of 18 December 1931, and the following shift dismantling of the Lithgow mills commenced, for their transfer to Port Kembla. That marked the end of the Lithgow steelworks. The weakness of markets consequent on the depression had crippled the original development plans through lack of funds, an element exacerbated by the high cost of split-site operation. In 1933 two mill projects were authorised – a 10”/13” mill (later No 1 Merchant Mill) and a sheet mill, intended as the basis for a tinplate production facility. The former was largely bought as new, with some recycled equipment, and went into service reasonably smoothly. The latter however presented major problems from its commissioning in November 1934 until in June 1935 work on the mill was abandoned. (The sheet mill was later the object of further work and was commissioned by John Lysaght Australia (hyperlink to JLA page). The cost of the mill and its delays were yet another factor which weighed heavily on the finances of AIS at that time. The Hoskins brothers were realistic about the chances of the Port Kembla plant growing (or even surviving) without further external capital. As a result in mid-1935 they raised with Essington Lewis of BHP (with whom they had had a friendship for some years) the prospect of a merger. The discussions were amicable, and progressed quickly. On 11 November 1935 an agreement was signed under which the ordinary shareholders in AIS surrendered their shares in exchange for BHP shares. Preference shareholders were not affected, and AIS remained a separate company, under BHP control. The Hoskins brothers continued to run the Port Kembla plant, now to be known as the Hoskins Kembla Works. AIS was to remain a BHP company for nearly 70 years and indeed for most of that time was the principal element of BHP’s steel operations. The association with BHP ended in 2002 following BHP’s merger with Billiton PLC in 2001. The former BHP steel division was broken into a number of companies of which the new owner of the Port Kembla plant, Bluescope Steel, was the largest. While significantly reduced in size and scope since that time, Bluescope Steel, Port Kembla, remains the largest single industrial operation in the Illawarra. While the Depression and development issues had impacted markedly on AIS, its major competitor, BHP, was in much more robust financial health as it progressed its evolution from a largely mining company to a diversified manufacturing and mining company. It was an early decision to focus on Port Kembla as the main component of BHP’s steel development. With its financial resources, BHP could afford to take a much longer view than was available to the Hoskins brothers. At the time BHP assumed control the Port Kembla plant included the single blast furnace, three open hearth steelmaking furnaces, and `rolling mills including a 27/28” mill, a 36” mill, a merchant mill and a rail and structural mill. Raw materials facilities off-site included a colliery and coke oven plant at Wongawilli, and limestone production at Marulan. BHP took early steps to address the problem issues of which AIS had been aware, while not being in a position to rectify them. Technical personnel from the Newcastle works reviewed the Port Kembla operation, noting particularly problems with standby equipment, and spare parts – both issues which had often markedly interrupted operations. A lack of professional engineering personnel was also identified, and remedied through recruitment. A significant expenditure (£325,000) was authorised to rectify many of the problems which had been identified. Shortly after the merger concrete steps were also taken to commence a programme of expansion. Additional land was purchased, taking the site area from 160ha to 800ha (400 to 2000 acres), including land later to be used by John Lysaght Australia (JLA). A major expansion round included a second blast furnace (blown in 14 May, 1938), a coke oven battery and byproducts plant (lit 9 October 1937), increased steelmaking capacity through two further OH furnaces (in 1939), a continuous billet mill (also 1939), and a range of major services facilities. Steps were taken also to secure additional coal supplies. The existing collieries Bulli Colliery and Mount Keira Colliery were purchased in 1936 and 1937 respectively. Later the Mt Kembla mine was to be purchased (1946) and a further new mine (Nebo Colliery) opened in 1947. The expansion (to a capacity around 600,000 tons/year) was able to contribute notably to Australian industry’s wartime support efforts. Two further OH steel furnaces had been commissioned by 1943. 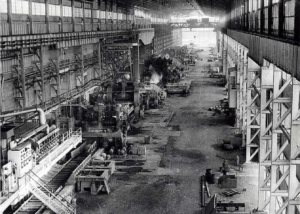 The wartime period also saw the addition of an electric arc furnace steel plant for special steels (in 1940), and the setting up of a number of manufacturing operations including the production of machine tools, marine engines, and munitions related activities. Another notable development involved the building under license of coal loading and cutting machines designed in the USA, to introduce the mechanised system of mining at the four AIS collieries now supplying coal to the steel plant. The period from 1928 to the end of World War Two was a time of major initial difficulty followed by almost continuous growth. In the period shortly after the war, though, it was the decision to focus Port Kembla production on flat products steel – strip and plate – which was to lead to its greatest growth. A third blast furnace was blown in on 27 August 1952, as the preparatory work for the new Flat Products section of the plant was commenced, on land reclaimed from Tom Thumb lagoon. The first section to commence operation was the hot roughing and plate finishing mills, (in a building underpinned by 150,000 tonnes of concrete foundations) on 15 February 1954. Already by then the existing bloom mill had been upgraded to feed the Flat Products plant, with new coke ovens and soaking pits installed to match the increased iron and steel output, meaning that by August 1953 Port Kembla could claim the highest output of any steelplant in Britain or the Commonwealth. 1955 saw the startup of probably the central feature of the new production direction, the hot strip mill, opened by then Prime Minister Menzies on August 30. The mill cost £40,000,000 and was able to process 1,000,000 tonnes per year. The product from that mill was not only important to AIS for its own further processing, but also to their near neighbour, John Lysaght Australia, for its coated steel business. For AIS, the earlier aim of tinplate production became a reality with the introduction of a hot dip tinplate line in 1957 – to be followed in 1962 by a (continuous) electrolytic tinning line. A cold strip mill to further extend the product range was put into service the year before that. A significant step was taken also in 1962 when the use of oxygen blowing was introduced to open hearth furnaces. The process of LD steelmaking had been commercialised by Voestalpine in Austria in 1952/3, and the use of oxygen lancing in open hearth furnaces was a means of obtaining some of the advantages of that process (in particular shortened heat times) in existing open hearth facilities. The process also brought to Port Kembla the first use of oxygen in full tonnage quantities, from the new No 1 Air Separation Unit of some 200/230 tons/day oxygen output. Oxygen injection was introduced also to blast furnaces, again for productivity reasons. Ten years after that first use of oxygen, full basic oxygen steelmaking (BOS) was introduced, in 200/250 tonne vessels, with the last open hearths closing in 1982 after the installation of a third BOS vessel. The use of ‘OG’ hood/offgas (non-combustion) systems on the BOS furnaces, which collected the BOS offgas unburnt, meant that the flames from the BOS flare stacks, where the gas was ultimately burnt, became a standard feature of the night sky. The ironmaking area also saw substantial process upgrades over the period. In 1957 a sinter plant (to agglomerate ore for blast furnace feed) was commissioned, shortly before the blowing in of the fourth blast furnace in 1959. That for a time held a world production record, but one taken from it by the No 5 blast furnace, blown in in May 1972. The development round which included that furnace (and the introduction of BOS steelmaking) also brought a lime kiln (for BOS use), additional coke oven and byproduct capacity, new sintering capacity, and significant increases in services capacity including steam, oxygen and electric power. The years following that round brought further substantial incremental development, including the introduction of argon-oxygen decarburising (AOD) for stainless steels (1975), vacuum degassing for conventional steels, and steel desulphurisation (1978). A major process shift occurred in 1979 with the introduction of continuous steel casting, in which liquid steel was cast directly into slabs for rolling in strip and plate mills, rather than being cast into ingots as was the original practice. Those ingots then required heating in soaking pit furnaces, and subsequent rolling into slabs. 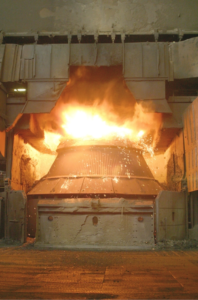 Continuous casting facilitated major energy savings. Further energy saving was achieved in 1981 with the installation of a top gas recovery turbine on the then largest blast furnace, (No. 5BF) which recovered much of the energy needed to compress the blast air for the high pressure furnace. The later 1980s also saw much improvement work, particularly in the extension of sophisticated computer control systems, particularly in the rolling mill area. But the decade had also seen a most significant shift in circumstances for the plant in its markets, a shift which was to lead to changes the effects of which have continued to the present day. The ongoing opening of product markets through tariff reductions, and increasing domestic costs, led to major losses in the industry, and a recognition that Australian manufacturing industry generally was poorly placed in terms of international competitiveness. A Steel Industry Plan involving tariff reduction, productivity improvement, bounty payments for certain products, major plant investment, and a degree of market protection was agreed in consultation between the industry firms, industry unions and government. That was to lead to investment in new plant, major plant rationalisation, and very significant reductions in employee numbers. These started in 1982, when full-time employees on site numbered around 20,400 excluding a modest number of full-time onsite contractors (having peaked at some 22,000 two years before). By the end of the decade, that number was 12,000, with the plant at similar production levels. By 2016, with production levels reduced to around half, that number stood at 3,000 full-time employees, and 1,000 full-time onsite contractors, the latter reflecting a shift towards a model in which operations which were necessary but not ‘core’ to the process of making steel were undertaken by dedicated contractors. The period also saw the closure of a range of production units – some because they were technologically obsolescent (such as open hearth steelmaking) and others as they were no longer seen as consistent with the plant’s production focus (for example tinplate production, and arc furnaces for special steels production). The result of these shifts, coupled with an improving Australian economy, had a strong influence on profitability. The late 1980s were years of rewarding operation for steel in BHP, with the division overall being the company’s largest profit earner, and Port Kembla leading that, with a return on shareholders’ funds of some 15%. These results had in large part come about through the major increases in productivity. In part due to that performance, the next major change took place in 1996 when a new No 6BF (rated at 7,200 tonnes/day) blew in on May 28 – the same day as the No 4 blast furnace shut down after 37 years of operation and 34 million tonnes of iron production. The plant then operated for some years as a two blast furnace, all-BOS, all continuous cast steel plant, in a very modern configuration. In 2009, the plant shifted to single blast furnace operation, during a major ($M372) reline of No 5BF. The furnace returned to operation in August of that year. However difficult market conditions, and reduced world demand, were to lead in 2011 to the closure of the No 6BF – leaving the reconstructed No 5BF as the last remaining blast furnace. Plant capacity reduced from around 5 million tonnes per year to around 2.5 million tonnes per year as the company ceased production for export, and structured capacity to meet domestic demand only. The Port Kembla steel plant is one which has seen highs and lows in its near 80-year life, and been part of a world steel industry which has changed radically, particularly with shifts in production from developed countries to the developing world, and severe cost pressures on players in the industry. The straitened circumstances of the industry in Australia mirror those of other developed countries – and also the circumstances in which the Port Kembla plant first commenced production. The plant transformed, survived and thrived then – and hopefully will do so again.